Erect, open shrub, the stems are sparsely branched unless pinched out at intervals when young. 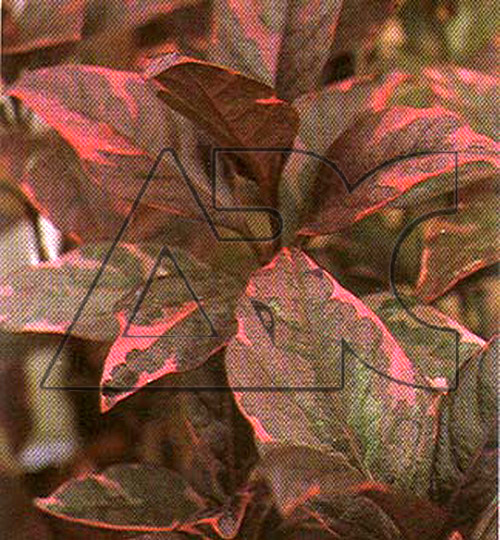 Ovate to broadly elliptic leaves, 10-15cm long, are deep purple, sometimes metallic green, spotted yellow, pinkish purple, pink, green and white. During summer, tubular white flowers, spotted rose-red or purple at the bases, 2.5cm long, are borne in dense, terminal spikes, up to 18cm long.